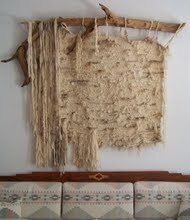 I am ‘being woven’ daily. I am growing in the LORD. I am learning from my Savior. I am truly loving each step, too. When I say I am being woven, God created me in His Love, in His perfection. I have been a weaver. I love the art of spinning wool, dying it in various natural ingredients, warping up the loom, the hoop or the frame, and then creating a weaving…a wall hanging or a pillow from these hand spun yarns. The warp is taut on the frame. The yarns are woven over and under each warp, row upon row until the piece is complete. Looking at the back makes me wonder if I could possibly know what I am doing. Loose ends are hanging everywhere, yet the front is beautiful. How does God see me? From the front? Do I see myself from the back? God knows me and knows what areas I need work on. I may look more like the back today, yet in eternity, will I be as the front? Perfected in Christ Jesus? I believe so. Oh, how marvelous! Hallelujah! I am allowing Him to take each woof, weaving it over and under each warp until I am done, until this life is complete. Then I shall stand before my King in His perfection. Oh my! Praise You, LORD. Thank You for loving me and weaving me to completion. May I sit before You and learn all I need to learn. Hold me closely as I progress. I pray I do! Discipline me when I need to be. Care for my precious mother as she journeys through this end of life at 94, almost 95. Hold her closely in her dementia, in her diabetes, in her anger and fears. Give her joyful moments and sweet memories in these days of her life. And, LORD, please hold me uprightly and closely as I care for her in the ways that You appoint for her through me. I pray for the nursing home staff as they provide for all her needs. Oh, I am so very grateful for them, each one of them. May I be a light in the nursing home in the Strong and Precious Name of Jesus, Your Wonderful Son. I pray for my sisters who live so far from us, knowing they miss our Mama. Bring them each to You, LORD. May You guide me by weaving my very being, who I am and what I do. I want to resemble the front even on the back, as best I can while here on this earth. I ask for these in the Name of Christ Jesus. Amen.